Would you like to join me as we create 2 ceremonies, preparing consciously for 2018? It’s such a Unique opportunity with all the heavenly aspects happening currently! eg…. the powerful Super Blue, Full moon with the Lunar Eclipse. the New Moon with the Solar Eclipse. Besides the large transits moving through the year, I see these eclipses working together like a gate, opening us to rebirth a new cycle! …. what are eclipses about? “Eclipses are significant events, helping to clear the way for something phenomenal & new to come into our lives, by highlighting what is blocking us or getting in the way of our natural expression. Sometimes conspiring to force us to release the old & adopt the new! These 2 eclipses of 2018 are closing the last 6 month cycle, begun with the eclipses of August 2017- or even further back, depending on your chart. There have been calls for our spirit to strengthen our individuality, to step up to the task & take a risk with following what our heart has always yearned for us to be. dominantly a year of INTERNAL REARRANGEMENT in preparation for 2018. Embodiment will be a key. 2018 energies will support your ability to manifest new intentions, release painful old wounds fast & learn to ask for (and RECEIVE) support. to clear away the past & any negative patterns, or heavy energies. …co-creating a new way of being with a solid foundation. Please RSVP for logistics & directions etc. You can attend just one evening if you wish, just let me know which for logistical reasons. Together though, these create a harmonious passage as we work with all levels of our existence! A Despacho is an Andean ceremony to bring balance, transformation & change into our lives. 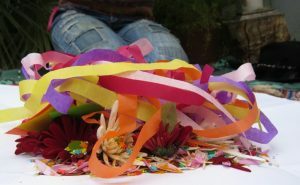 In the Andean traditions of Peru important transitions or beginnings are often marked by a prayer bundle, offered to the Earth (Pachamama) and Divine spirits etc. There are many types of Despachos. Some offer ayni (balance), while others offer to remove the negative energy in one’s life, and others offer love & prosperity – gratitude or connection. This colourful, multi-layered bundle is made up of natural & burnable materials that represent the mountains, the earth, crops, plants, animals, the sea, angels & other aspects of nature. or buried so that the prayers are released slowly to the Earth, grounding them gracefully. Let’s create a sacred mosaic of all that can be possible in our lives.